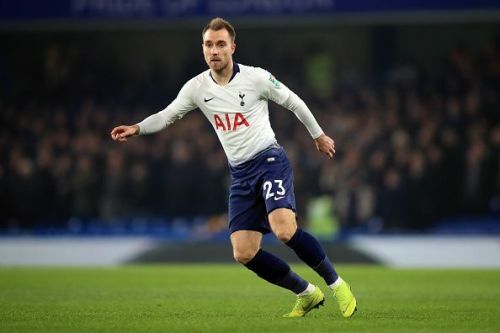 According to the Daily Express and ESPN, English Premier League giants, Manchester United and Chelsea will battle for Tottenham Hotspur star Christian Eriksen as Spanish giants Real Madrid have dropped their interest in securing the service of the Dane. Eriksen's current contract will expire in June 2020, which would make his move out of Tottenham very possible in the immediate few transfer windows. Christian Eriksen has been one of the most integral parts of the Tottenham Hotspur team this season. The 26-year-old Danish midfielder is sublime on the ball and terrorizes opponents' rearguard with relative ease. His ability to create chances at will makes him one of the most dangerous players in the Premier League, and he has also racked up four goals and provided eight assists in the league so far this season. His profound impact is only second to Harry Kane and as a result, Tottenham are third on Premier League table, nine points behind league leaders LIverpool. The team has also qualified for the knockout rounds of Champions League in a group comprising PSV Eindhoven, Barcelona, Inter Milan. Despite his splendid display in the Premier League, Eriksen is yet to renew his contract with Tottenham so far. According to the report, Manchester United and Chelsea have been boosted by the fact that Real Madrid are ready to end their interest as Eriksen will cost them too much. Both United and Chelsea will face massive competition from Paris Saint-Germain and Bayern Munich but they are confident of persuading Eriksen to stay in the Premier League if he decides to leave Tottenham. With Eriksen seeking to take a step up in his career, it might be the right move to join one of the Premier League giants where he will have more chance of winning a major silverware. The possibility of a move in the current January transfer window is highly unlikely as both Tottenham coach Pochettino and Levy will not let go of the player mid-season at any cost. They might grudgingly be forced into a sale in the summer transfer window if the Dane decides not to renew his contract with the club. There is no doubt that Eriksen is an asset for any club and he will have a huge impact with the Premier League clubs if decides to join them. Meanwhile, Chelsea and Manchester United are in the hunt for the top four spot in the Premier League but will need reinforcements if they need to compete for the title among other trophies.